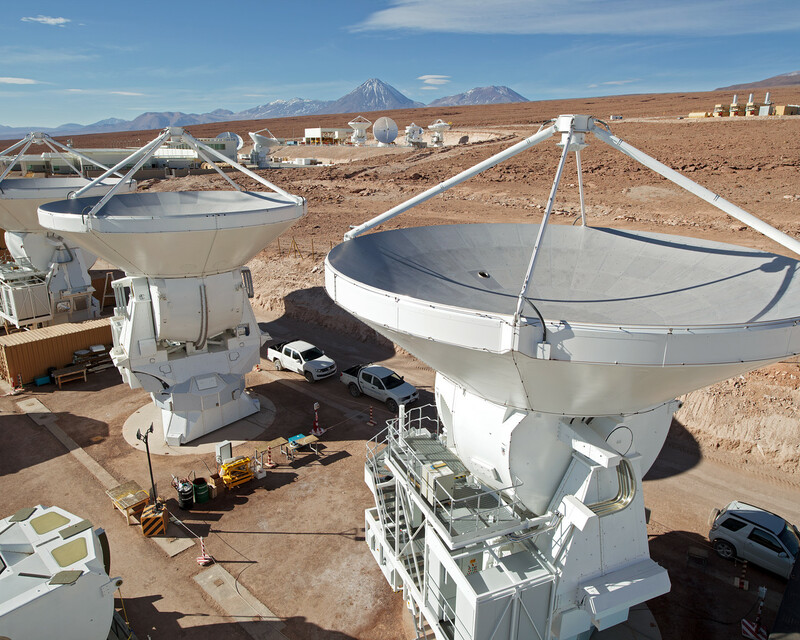 In this photograph from 2012, we see antennas destined to become part of the Atacama Large Millimeter/submillimeter Array (ALMA). 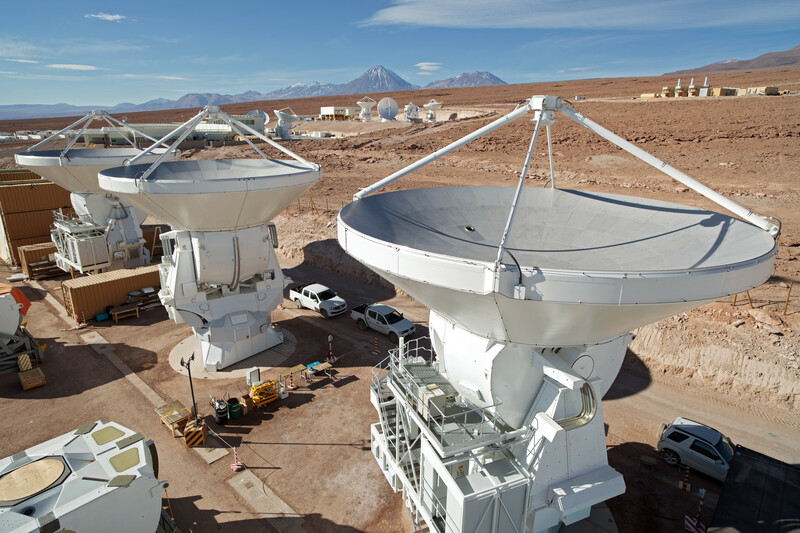 The three antennas in the foreground, as well as some of those in the background, were supplied by ESO as part of its contribution to ALMA, through a contract with the European AEM Consortium . In total ESO is providing 25 of the 12-metre-diameter antennas. A further twenty-five 12-metre antennas are provided by the North American ALMA partner, while the remainder, a set of twelve 7-metre and four 12-metre antennas comprising the Atacama Compact Array, are provided by the East Asian ALMA partner. The antennas are seen here at ALMA’s Operations Support Facility (OSF), at an altitude of 2900 metres in the foothills of the Chilean Andes. Those in the foreground are in the AEM Site Erection Facility, where the antennas are assembled and rigorously tested before they are handed over to the observatory. The antennas in the background have been handed over, and are undergoing further tests or having their sensitive receivers installed. Once the antennas are ready, they are transported to the Array Operations Site, on the Chajnantor Plateau at an altitude of 5000 metres. There, they join their counterparts as part of the ALMA array, working to study some of the deepest questions of our cosmic origins. Even once all the antennas are ready, the OSF will remain the centre of activities for the daily operation of ALMA, as a workplace for astronomers and the teams responsible for maintaining the observatory. On the horizon is the Andes mountain range, the tallest peak belonging to the conical volcano, Licancabur. Licancabur marks the border between Chile and Bolivia and dominates the landscape of the area.